It’s well known that planning a wedding can be stressful and expensive. From the food, décor and photographers, to the venue, dress and honeymoon, how does one afford everything? That, friends, is where STONEFIRE Grill comes in… Let us take care of you! 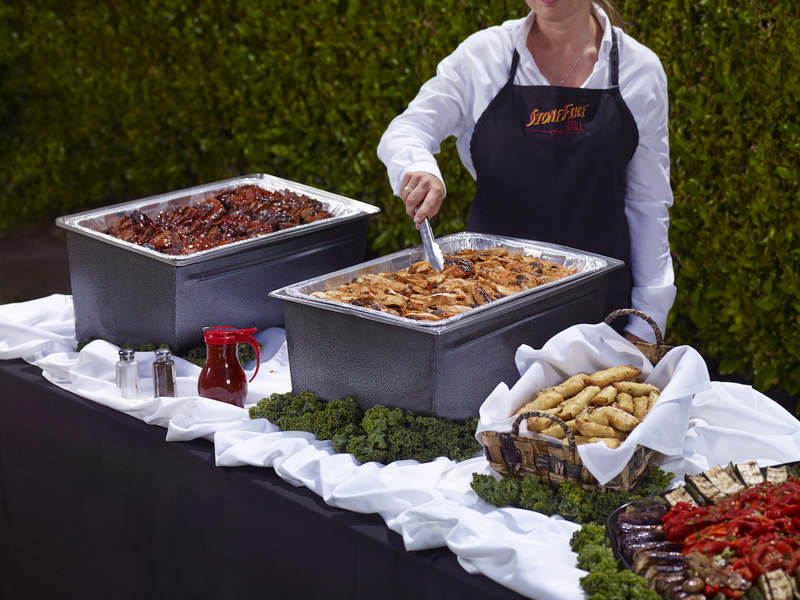 Hailed by the Style Network as the unparalleled option for “catering a scrumptious meal on a budget,” there is good reason thousands of newlyweds have chosen STONEFIRE Grill to cater their wedding; extraordinary food, exceptional service and cost-effective pricing. With prices staring at $8.99 per person, enjoy delicious food while staying under budget. Rest assured, choosing STONEFIRE Grill for YOUR big day will be one of the greatest decisions you’ve made thus far – perhaps besides saying “YES!” Let us take the stress away from you and know, delicious food and genuine, quality service await. From setting up, serving and cleaning up, our caterers will provide exactly what you are looking for. Need help cutting the cake or scraping plates? No problem! Let our Wedding Specialists know and we are happy to accommodate! Now – let’s get to the food. Everything is made from scratch with homemade recipes. From our slow-cooked Mesquite BBQ Tri Tip and delectable Lemon Garlic Chicken to our signature BBQ Chopped Salad, Garlic Mashed Potatoes, Freshly Baked Breadsticks and more, leave your guests satisfied with our savory food. Looking for dessert? Our Incredible Carrot Cake is famous and a wonderful option. For just $2.29 a person, indulge in the same recipe that has been in the family for decades! If you have not yet experienced the deliciousness of STONEFIRE Grill, we would like to invite you to a tasting at the nearest STONEFIRE Grill to you. Simply call our Wedding Specialists at 888.649.5783 to make reservations. “My husband and I were extremely delighted with the food, the staff, everyone was complimenting everything. The staff was excellent, the overall experience was awesome. We would definitely highly recommend and return, should we ever need catering again.” – Julie C.
Are you trying to accommodate guests that are Vegetarian, Vegan or Gluten Free? No problem! With over 15 unique, market fresh salads and from-scratch dressings made daily, to our Roasted Cauliflower Salad, Macaroni & Cheese or famous Tomesto Pasta, STONEFIRE Grill offers variety and keeps those with dietary needs in mind. Let our Wedding Specialists know of any dietary needs and they will be happy to help create a menu that accommodates all. From the moment you place your order with our friendly Wedding Specialists until your event ends, you will receive exceptional service from start to finish – guaranteed. To get started, please call our Wedding Specialists at 888.649.5783 or request a quote today!